T. Hello, Belinda, glad to have you on the blog. Please introduce yourself with a bit of biography. B. Hi, and thanks for having me! I am a usability analyst by day and a historical fiction writer by night and weekend. I have my undergraduate degree in computer engineering, a minor in English, and a master’s in human computer interaction design. I live in central Ohio with my laptop, tea, and books. Many, many, delicious books. B. I began writing when I was around five years old. My first story that I remember was about a king and his daughter. I remember getting into an argument with my first grade teacher about how to spell ruler. She didn’t understand I wanted to talk about a king, and therefore, was “ruler” spelled the same as the measuring stick, or was it different for people? B. Suffice it to say, my first grade teacher was not my favorite writing teacher. My eighth grade teacher, Mrs. Kent, had an after-school writing club that I attended. I still keep contact with about half of the girls who attended that club with me. That club really made me believe that people could and would take my writing seriously, if I did. B. 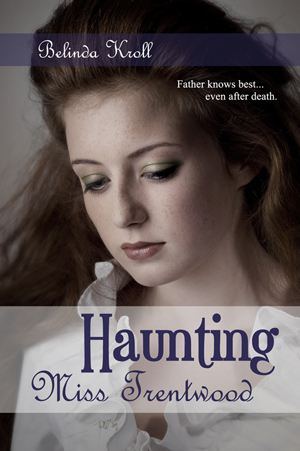 My latest book is Haunting Miss Trentwood, a quirky historical romance that features an opinionated ghostly father and a very annoyed, very alive daughter. The tagline is “Father knows best… even after death.” Read below for the back cover blurb. Resigned to a lonely life in her quiet manor house in the English countryside, Mary Trentwood is horrified when she watches her father crawl from his grave the day of his funeral. Mary clings to her routine, finding it increasingly difficult to avoid her father’s ghost as she questions her sanity. Mistaking the newly-arrived Alexander Hartwell to be her father’s solicitor—for who else would interrupt her time of mourning?—Mary welcomes him into her home reluctantly, not realizing Hartwell is on the hunt for a blackmailer. B. I thought that Haunting Miss Trentwood would be the first of two books, but when I cut the main character’s little brother from the book, I realized that it was meant to be a stand-alone work. As great as series are for reading, and even for authors who are trying to build a solid audience, I just can’t seem to write them. B. I outline the main points, but “pants” the steps that take you from one major plot point to the next. It’s almost like taking a road trip… I know I have to hit these main stops, but if I have a little adventure in between, awesome. Sometimes the best things are unplanned. B. I think we live in exciting times. I have no idea what print publishing will be like in the future, but digital publishing is one of the coolest things that have happened to me as an author. I’m able to cut out the middle man and go straight to my readers; I’m able to learn which stories are working and which aren’t so I can go back and make changes. I can keep my prices low and still make enough to allow me the ability to keep writing. I love it. B. I love connecting with people! You should visit me at my Facebook page http://facebook.com/BelindaKrollFans or on my website http://worderella.com so we can continue the conversation. Thanks for having me, Thomas! T. Thank you for visiting. I LOVED Haunting Miss Trentwood! Belinda has a wonderful voice as an author. Jen, I love how you spread your support around the web. ❤ you!